Dead Spike-san, witnessing defeat after defeat, had a bright idea. If he ate more, maybe he could become stronger…? Dead Spike-san and Ragna set off on an epic(?) journey. Groove to a total of 20 musical tracks from the BlazBlue series! Simple to Learn, Tough to Master! Using just the L and R buttons, gobble up as much as you can and aim for a high score. Three different character pairs to play as! Dead Spike-san & Ragna, Ouroboros & Hazama, and Nirvana & Carl! 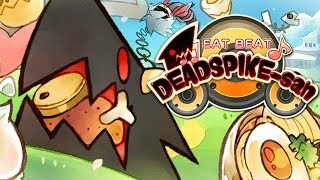 EAT BEAT DEAD SPIKE-san Out Now on Nintendo Switch! EAT BEAT DEAD SPIKE-san Coming to Nintendo Switch March 22, 2018!